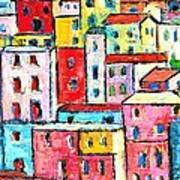 Manarola Colorful Houses Painting Detail is a painting by Ana Maria Edulescu which was uploaded on January 20th, 2013. 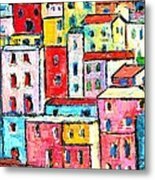 Manarola may be the oldest of the towns in the Cinque Terre, with the cornerstone of the church, San Lorenzo, dating from 1338. The local dialect is Manarolese, which is marginally different from the dialects in the nearby area. 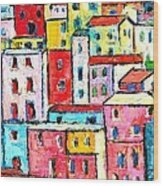 The name "Manarola" is probably dialectical evolution of the Latin, "magna rota". In the Manarolese dialect this was changed to "magna roea" which means "large wheel", in reference to the mill wheel in the town. Thanks a lot, dear Deya. Ana, this is such a happy painting, the colors are so vibrant! L/F! Thank you so much, AnnaJo. 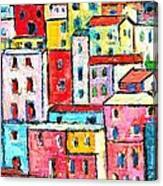 Thank you very much, I J T.
Another Great cityscape painting with wonderful style and fabulous colors. Thank you so much, Oiyee. Thank you very much, Florin.